Our consumption of plastic and the huge problem of waste and recycling is a massive issue that, I’m pleased to see, is big news at last. 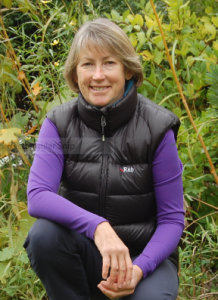 In this post I look at the many ways that gardeners can cut down on plastic products, with alternatives that often result in better plants and saving money as well as being good for the environment. Win/win all round. Starting with the biggest issue: Black Plastic Pots, the horticultural equivalent of single-use carrier bags. The mind-boggling quantity of around 500 million are in use in the UK each year, with the majority ending up going to landfill or incineration. Kerbside recycling isn’t an option and while some municipal waste sites do take pots in their ‘bulk plastic’ waste skips, the machinery used to sort plastics for recycling has difficulty identifying black plastic so pots may eventually end up as waste anyway. 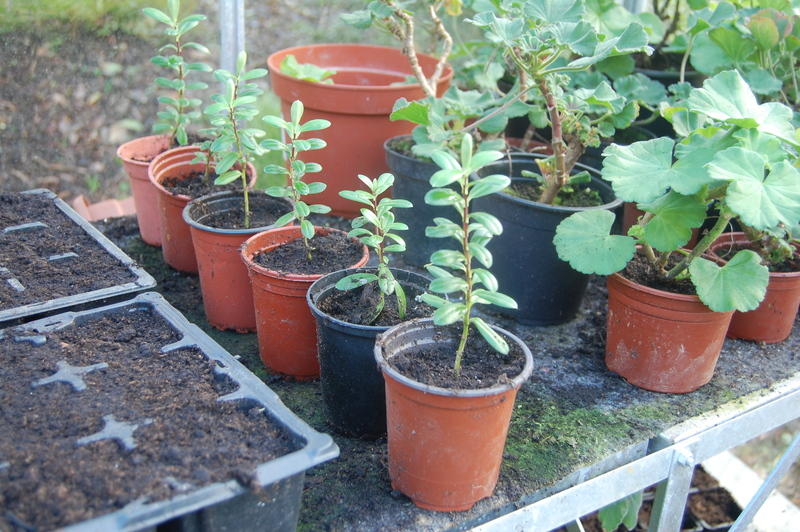 Some garden centres do offer collection schemes, in some cases to be made into other products (like those made by Cornwall-based A Short Walk) but at present this only tackles a very small percentage of the ‘pot mountain’. Companies are starting to offer alternatives in other colours such as taupe or grey which should be recyclable, and while this is a nod in the right direction, recycling still consumes energy and isn’t a great answer. Biodegradable pots look to me to have much more potential: made from materials such as bamboo, coir fibre, rice husk and Miscanthus, they’ll break down over time and can eventually be composted or put in the ground complete with plant. 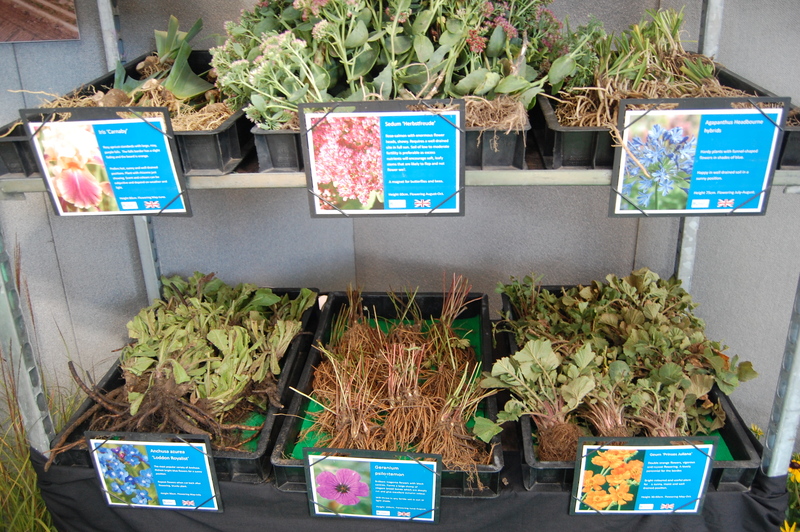 Before growing in containers became commonplace, plants were grown in nursery fields and then sold whilst dormant (not in active growth), during autumn to early spring. This gives great results for gardeners as plants get settled into their before they need to burst into growth. 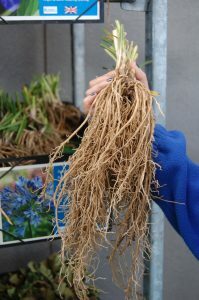 Bare root plants are often cheaper to buy and are usually bigger and better quality with much more developed root systems compared to pot grown. 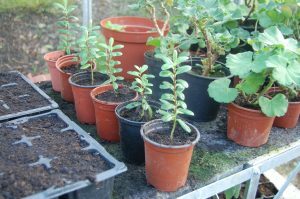 Plants to buy bare root include ornamental trees, fruit trees and bushes, roses, hedging and herbaceous perennials (do an internet search for ‘suppliers of bare root plants uk’ or check out the classified adverts in gardening magazines). 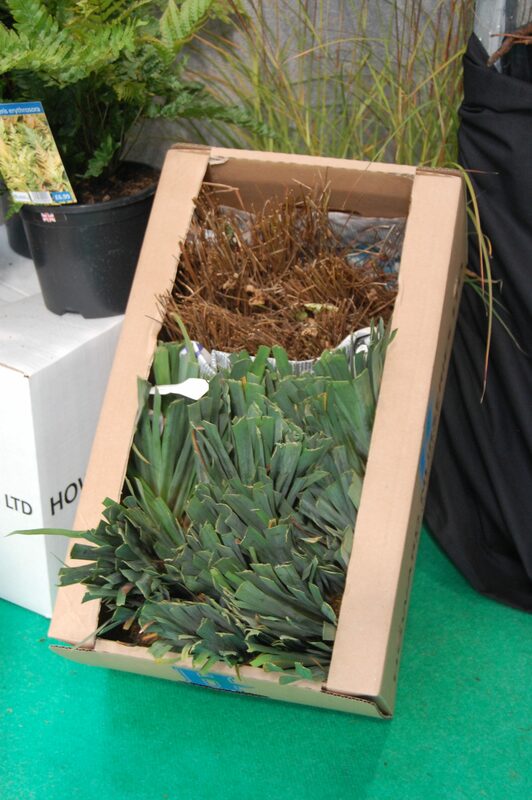 At a recent horticultural trade show I was very impressed by Norfolk-based Howard Nurseries (note wholesale only, alas) which not only supplies magnificently well grown herbaceous perennials, but packages using only newspaper, brought in by staff and shredded. 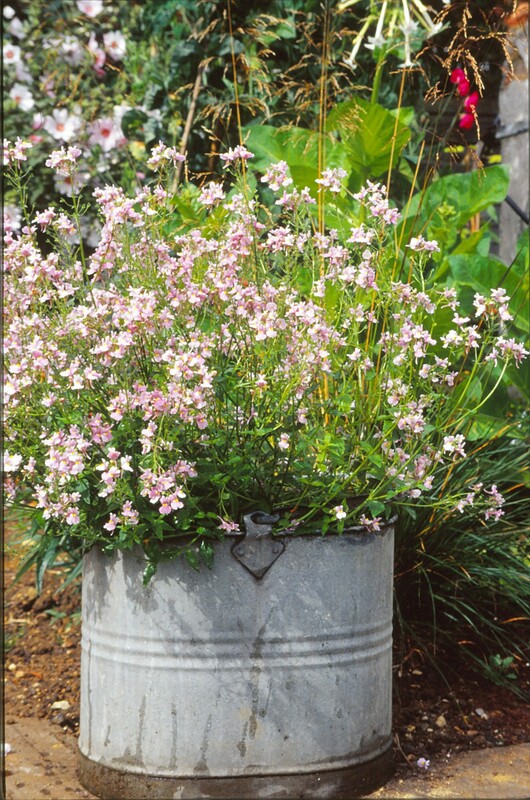 Nurseries such as Bluebell Cottage (supplies to gardeners) are reusing their plastic pots and decanting mail-order plants into paper and card wrapping for despatch. 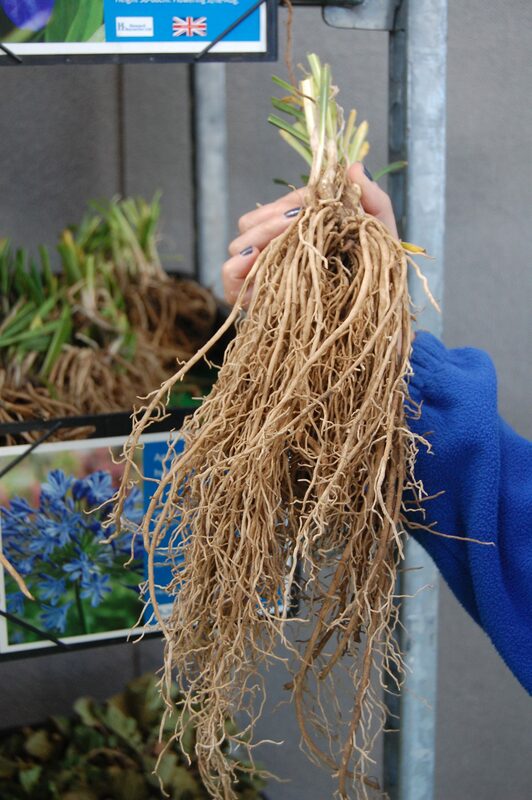 While buying bare root does call for thought and planning rather than just strolling in to a garden centre or nursery and buying on impulse, that’s no bad thing. 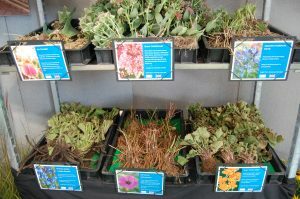 Not only do plants establish better as described already, but you’ll save on a load of watering (as anything planted in spring or summer must be kept watered as it won’t have put down roots to support itself). From my garden design and planting work, I end up with a heap of plastic containers – but they get reused, time after time, to propagate lots more plants, flowers and veggies. On the rare occasions I need to buy in things like modular inserts and roottrainers for raising seeds, I buy good quality sturdy ones that can be washed and reused. Avoid cheap plastic like the plague: last year, short of time, I bought a pack of supermarket seed tray inserts which fell to pieces during their first use. Never again. This year I plan to buy a soil block maker (Gardeners World viewers will have seen Monty Don using one of these) and gradually replace my plastic seed trays with wooden ones. Avoid plastic for larger patio pots if you can in favour of sturdy long-lived ones made of wood, metal, terracotta etc. If it’s had a past life, so much the better: I love the super-sturdy wooden half barrels sold by Markstone Granite near Lifton in Cornwall: these are ex wine casks and make the car smell fabulous on the drive home! Bear in mind that anything that holds compost and can have drainage holes made in it can become a plant container: zinc tubs and mop buckets look gorgeous on the patio, and I have a suite of ‘beachcombed’ fish boxes for less visible spots: great for growing salads, strawberries, and containing the rampant herb mint. Compost does, needless to say, come in plastic bags, and though I keep my buying to a minimum by making my own from leaf mould, garden compost and food waste composted in wormeries, I do buy in occasionally, particularly for seeds and young plants. As consolation, the bags have a multitude of uses, principally for bagging up, stacking and composting the roots of perennial weeds which can’t go in the compost bin. When it comes to tools, I’m a firm believer in ‘buy once, buy right’ and opt for wood and metal that will last for many years. Labels made of metal, wood and slate are widely available, plus whilst gardening I put aside any nicely-shaped stones or bits of slate that can be painted or written on with an indelible marker pen. Razor shells collected from the beach make attractive markers too. An, garden twine made of nylon may seem such a small thing, but it could be a killer for birds – they’ll pick up fallen oddments, weave into their nests with the danger of entangling themselves or their chicks. And there’s so many excellent biodegradable options, from stout ‘hairy’ pea & bean string to the gorgeously coloured Twool made from the fleece of Dartmoor sheep. From the smallest ways to the largest, we can all tread a little more lightly on the earth. And a final thought. When anything plastic comes to the end of its life, do dispose of responsibly. The plastic waste that contaminates our seas and waterways, as seen so memorably on Blue Planet, didn’t get there by itself!